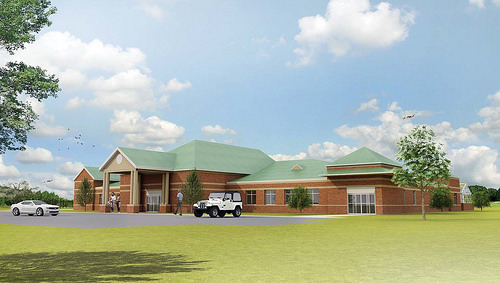 A veterinary medical referral center to be operated by the College of Veterinary Medicine will be the centerpiece of the Auburn Education Complex in Gulf Shores, a 24,000-square-foot facility that will serve as an academic satellite complex for Auburn and a resource for Gulf Coast veterinarians and residents. Auburn University and the City of Gulf Shores are moving forward with plans to build an educational complex in Gulf Shores, which will be located at the corner of the Beach Express and County Road 8, adjacent to land acquired by the City of Gulf Shores for a new high school and the planned Coastal Alabama Center for Educational Excellence. 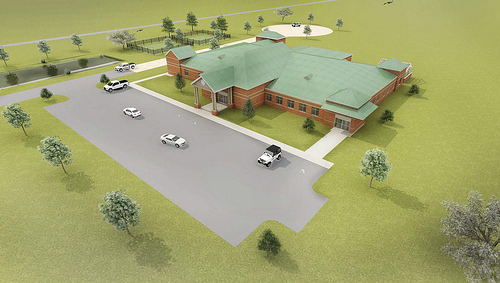 The referral center will serve as an extension of the college’s Veterinary Teaching Hospital and will provide specialty veterinary services as well as expanded educational opportunities for Auburn veterinary students in south Alabama and the surrounding region. Calvin Johnson, dean of the College of Veterinary Medicine, said the Veterinary Teaching Hospital has engaged south Alabama and the Gulf Coast region for many years with specialty veterinary services and continuing education for veterinarians. “We see this as an opportunity to more efficiently serve regional veterinarians and advance animal health while providing an expanded educational experience for our students and residents,” he said. Foley veterinarian Dr. David Dykes ’82, said he welcomes the referral center to south Alabama, as it will mean faster medical care for critically ill patients. “It will be 15 minutes away versus four hours away and that is important when dealing with critical healthcare issues. Patti Hall, director of the Alabama Gulf Coast Zoo, sees the facility as a win-win for animals at the zoo and for veterinary students to expand their exotic animal educat ion. By having a base of operations in Gulf Shores, Auburn will enhance its student engagement in veterinary clinical education and laboratory training in disciplines unique to Alabama’s Gulf Coast, including marine mammal medicine, aquatic animal pathology, zoological and wildlife medicine and emergency response. The Coastal Alabama Center for Educational Excellence is part of a strategic plan, “Small Town, Big Beach Vision 2025 for Sustainability,” adopted by Gulf Shores Mayor Robert Craft and the Gulf Shores City Council in 2014. With education as a top priority, Gulf Shores plans to establish the Coastal Alabama Center for Educational Excellence to promote access to higher education. The academic campus will feature a new high school and a new location for Faulkner State Community College, and will encourage affiliations with four-year universities. Additional Auburn programs expected to use the facility include the College of Agriculture; the Auburn Aviation Center; the Office of Research and Economic Development; and the Alabama Cooperative Extension System. The Auburn University Board of Trustees agreed at its September meeting to authorize President Jay Gogue to execute a lease agreement with the Gulf Shores Public Education Finance Authority, who will purchase the property in Gulf Shores, build a structure and lease it to Auburn for the university’s needs.